Someone asked a question which was then down-voted once, upon which I answered and someone up-voted my answer. After that a moderator deleted my answer and the question was closed being exact duplicate. I guess in an all I should not loose reputation more that 10 because it was upvoted by someone and then deleted. However I lost 25 reputations in this event. I would like to know what I am missing upon? I lost a reputation of 25 and I am unable to understand the individual events or if its a bug. The 25 reps was originally given when the OP accepted your answer and you gained an upvote. 15 points for an answer, 10 points for an upvote = 25 rep. However - the community considered that this question was a duplicate - it had already been answered by a previous question. Being good citizens we closed the question with a link to the question. That leaves the dangling answer. Ask Ubuntu receives most of its internet traffic from search engines. 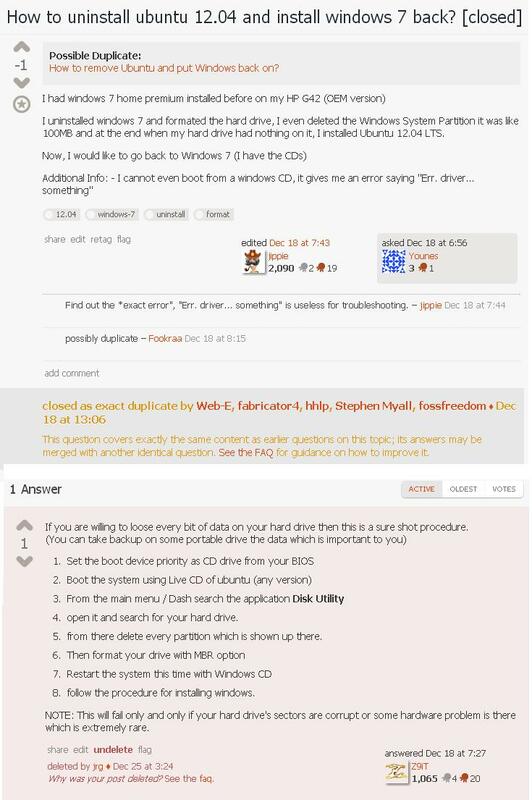 When someone is searching for a question, they click on a link and it lands on a Ask Ubuntu page. Stack Exchange sites automatically redirects users to the correct web-page if the question has been closed as a duplicate - BUT only if the duplicate question has no answers. Thus - being good janitors, your answer was removed - in this case by a moderator but it could equally been removed by high-rep community members. The answer could have been merged with the duplicate question - however, the answer IMHO did not really substantially offer any new insights that were already covered by the duplicate, so was correctly deleted. Deleting an answer, removes the unaccept status - thus 15 rep is removed. For answers that have less than 3 upvotes, the system automatically removes those votes - thus the 10 rep removed. Its not a bug - just the way Stack Exchange sites work. If you see a question as a duplicate, flag it as such. Pop into chat to discuss with others if required. Well, you are aware of where the reputation came from, and you are aware on how you lost it. The reasons for it are explained here Someone deleted my answer in a duplicate post, why?. Lets put it this way, if the post is a duplicate an the contents of your answer are unique and useful, your answer would be merged with the main post and you would only loose the accepted answer reputation. Since we are constantly cleaning up and your answer is similar with the ones already provided on the main post (note: not saying you copied it from there, its just redundant to have the same information on 2 similar answers on the same post) that did not happen. That only leave use with the option to delete your answer so that auto forwarding works.